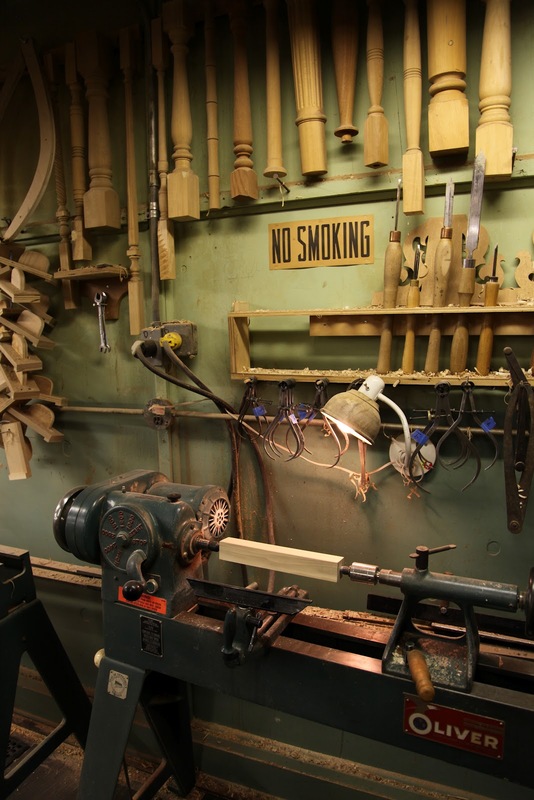 I recently attended "The Woodworking Shows" exposition at the Maryland State Fairgrounds. 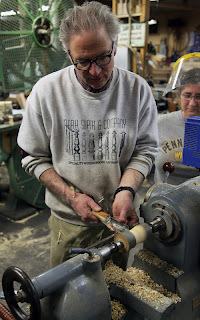 There I stopped at a demonstration booth for Mark Supik & Co., a family owned, Baltimore based, production woodturning company. The name of the company rang a bell with me as I had been in Boy Scouts with a Supk, which turned out to be Mr. Supik's nephew, and a current employee of the company. Mr. Mark Supik was demonstrating on the lathe at the show and made turning look so fluid and effortless that I was inspired to do something I hadn't done before, sign up for a class. I grabbed a flier and noticed that they also had a raffle style drawing for a free class. I dropped in a card and had a short conversation with Mrs. Supik about the company and then was on my way. About a week later I got an email, I had won the drawing for the class!!! What a great surprise (I never win anything), and conveniently timed too! The class was their "The Right Start" class which focuses on spindle turning and turning basics, which was perfect for my level of...ahem...skill? 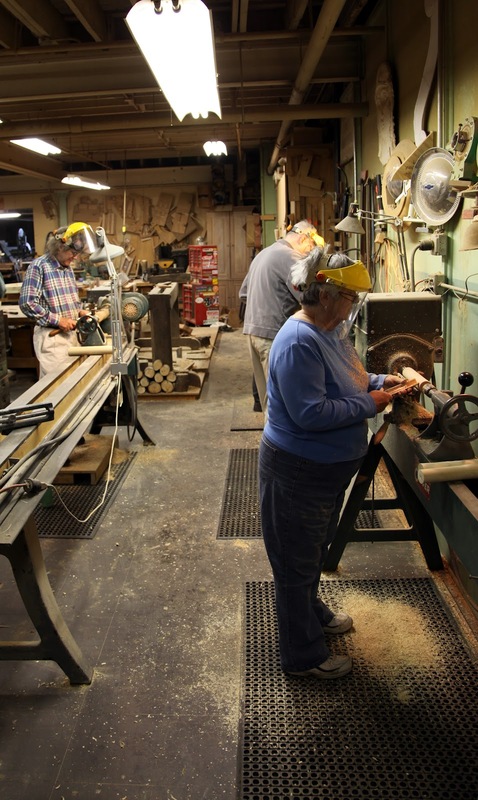 They provide the tools, safety gear, lathe, instruction, a delicious lunch, and most importantly a coffee and doughnut breakfast. So, on Saturday morning I drove up to Baltimore and walked into an old brick industrial building housing Mark Supik & Company's Woodturning and Beer Tap Handles. 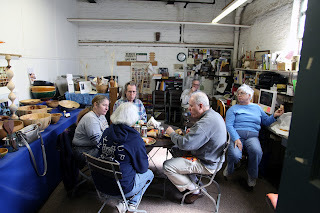 We started the morning with some introductions, lighthearted conversation and the necessary caffeine and sugar intake required for any woodworking activity. As with many gatherings of woodworkers, we found right away that we all had quite a bit in common with each other. There was even another Air Force Vet/Canon camera enthusiast! The class was small, six including myself, which I found to be perfect for this style of instruction. The small class size allowed for easy to watch demonstrations and some great one on one instruction from Mr. Supik. 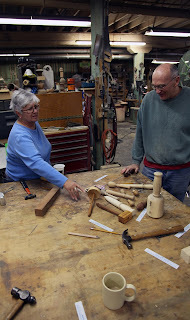 Both Mr. and Mrs. Supik greeted us into their workshop and immediately made everyone feel comfortable and at home. 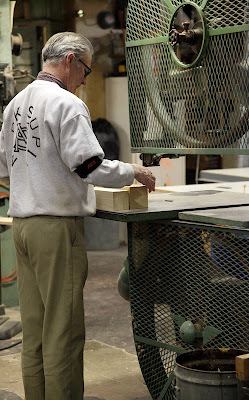 I got the impression from the start that they really love what they do, and are (rightfully) proud of their business. Mr. Supik gave us the nickel tour of the shop and explained that, among many turned production pieces like the spindles in the photo below, they also produce tap handles for bars and microbreweries. They have a large and impressive display outside the shop office. 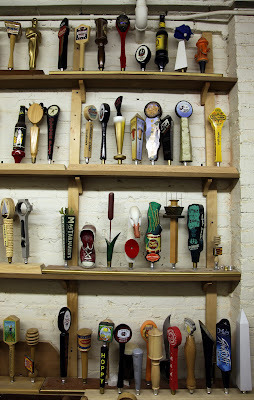 They not only turn tap handles, but they create custom carved, cast, painted and beautifully finished taps as well. Whether it is cheap labor or the fact that they just don't care, some microbreweries are trying to work, often unsuccessfully, with Chinese companies to purchase taps like these. To me, it seems to fly in the face of what craft brewing is all about to go halfway around the world to purchase something that is hand crafted right here at home. Not to mention the quality and attention to detail that this company puts into their work. 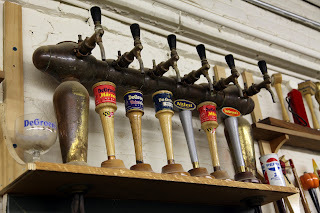 The tap shown below with the caricature of Edgar Allan Poe was created in their shop by hand carving the original Poe, casting the others in urethane and then painstakingly hand painting each one (to include his awesome mustache). I'll drink to that! After the brief tour we got down to business. Mr. Supik beautifully distilled years of experience down to a smooth, easy to swallow instructional single malt. He gave some important safety instructions, the basics of the tools we were going to use and an overview/history (hurrah! tool history is my favorite!) 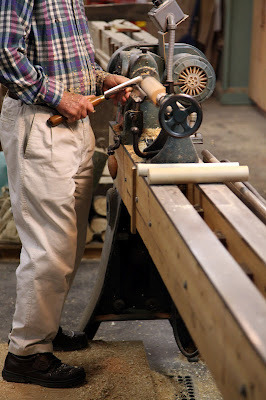 of the lathe. Within the first twenty minutes we were all on our own lathes successfully turning dowels. The first two minutes on the lathe had me hooked. 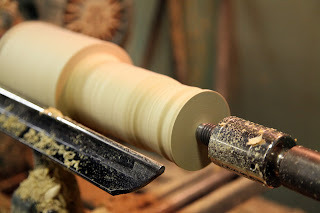 All I made was a cylinder from a piece of square poplar and I was in love with this new-found ability. We turned dowels from several different species, including some interesting (and incredibly beautiful) straight grained douglas fir they had salvaged from an enormous vinegar vat at a local vinegar producer. 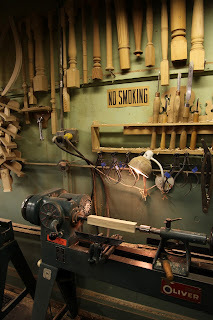 As soon as I started cutting the fir on the lathe I could smell the sweet acidity of the aged vinegar mixed with the earthy overtones of the douglas fir. To my amazement, with some quick one on one instruction, I was able to get a silky smooth surface on the fir which I had thought would end up being a pulpy fuzzy mess. My Workstation For The Day! After turning our dowels with the roughing gouge we got instruction on using the parting tool and spindle gouge to cut beads in our dowels. 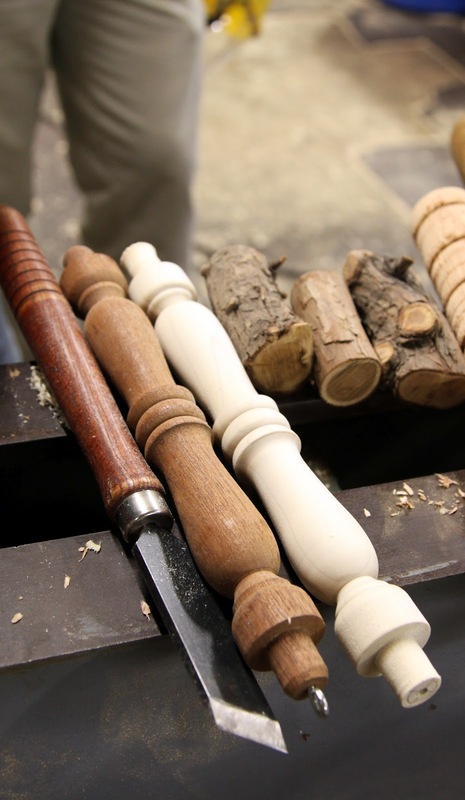 Mr. Supik emphasized that a lot can be done with just these three simple turning tools so those were what we worked with for the basics class. 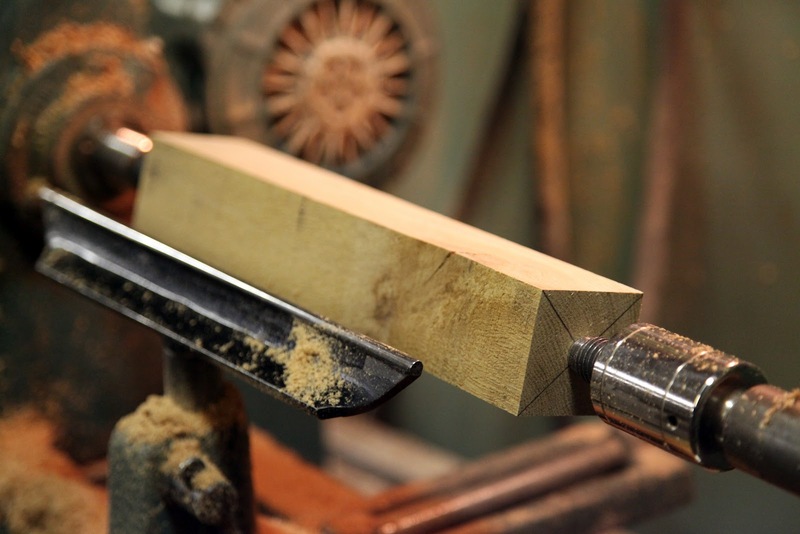 Repetition, muscle memory, and watching the horizon develop on the work piece (rather than watching the chips fly from the tool) were covered as well, and we got some golden tips and tricks to get the most out of our tools. By lunchtime shearing wood at 1000rpm felt as comfortable as hand-sawing a tenon. We got instruction on cutting coves shortly before lunch, before I knew it the morning had flown by! We broke for a delicious lunch brought in from DiPasquale's Market which I would definitely recommend if you are in the Baltimore Area. The lunch conversation naturally centered on woodworking, turning, tools and general awesomeness. 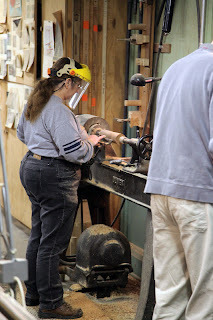 All of the tools we used that day were hollow ground, honed and in great condition. 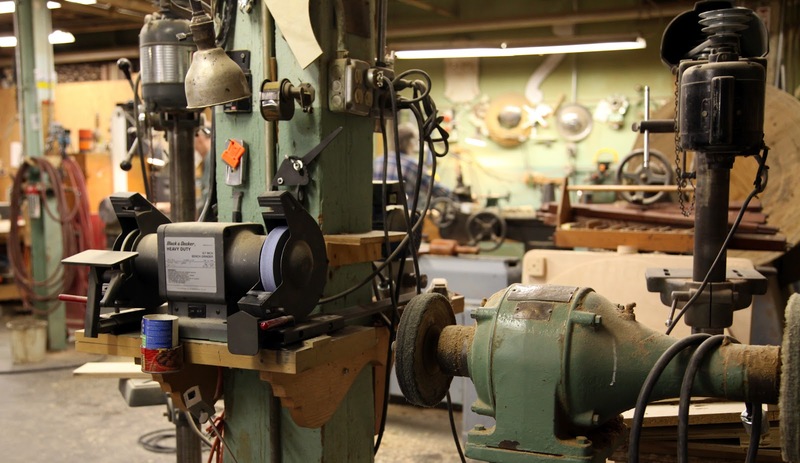 The shop sharpening setup can be seen in the photos below and Mr. Supik uses a diamond slip stone (which he also sells) to remove the burr on the inside of odd shaped tools. It looked like a Wolverine type setup on the grinder and then several honing wheels on the adjacent motor. 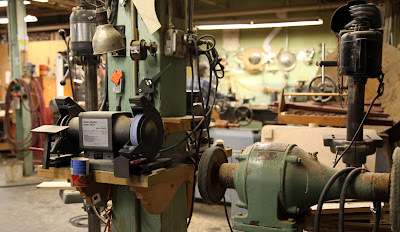 This is what I had expected, especially at a production shop where time is money, sharpen quickly and effectively and get on with the day. The shop is also home to some really exquisite pieces of cast iron. 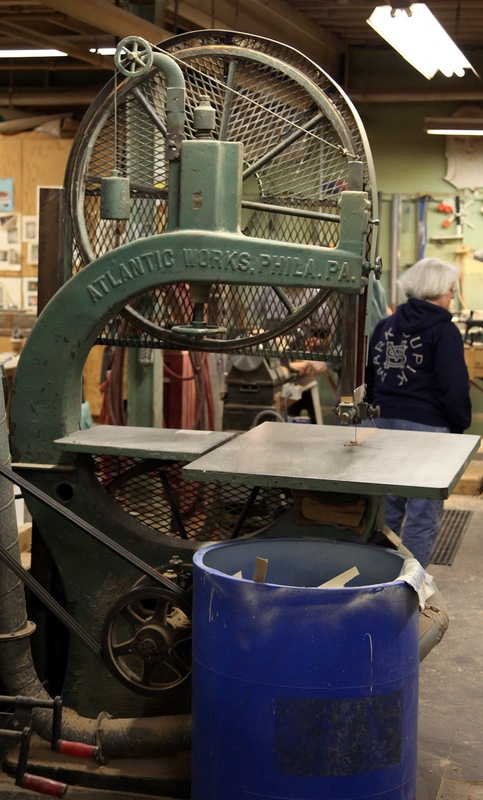 Apparently, Mr. Supik is a collector of old machinery (and his wife is patient). 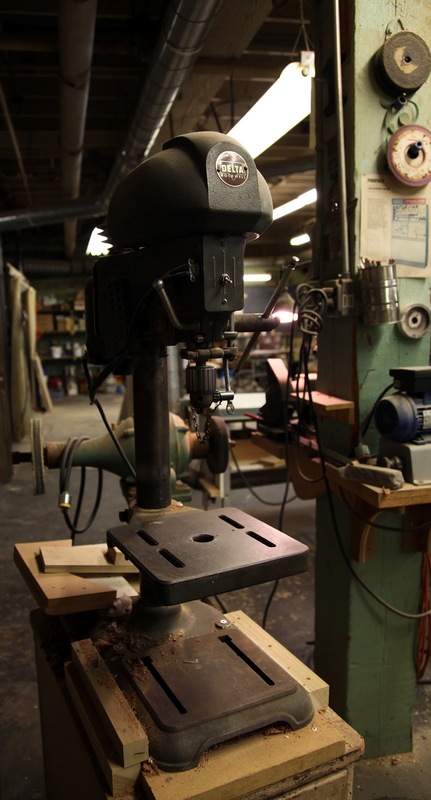 His bandsaw was just one of several pieces of cast iron sculpture (think Michelangelo's "David") he uses in his shop. What a joy working on this massive machine would be, if I only had the space...maybe my wife wouldn't notice one in the living room? 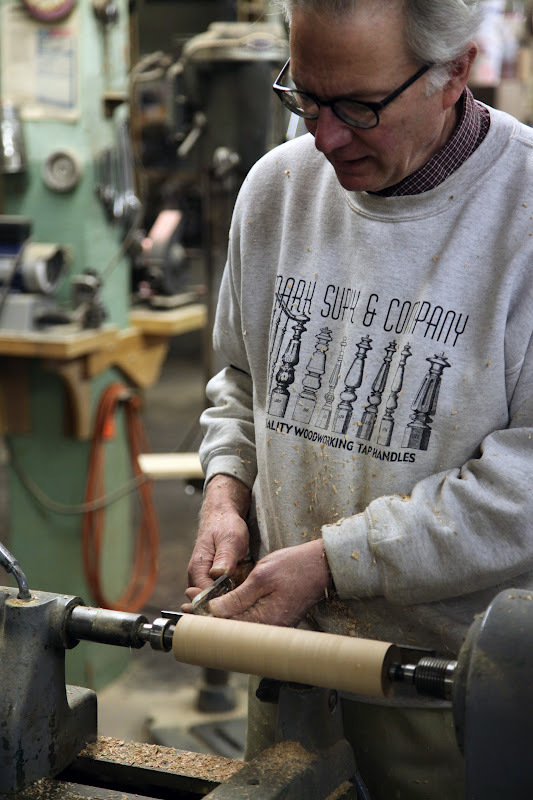 After a stretch and some more caffeine, we were back at our lathes. 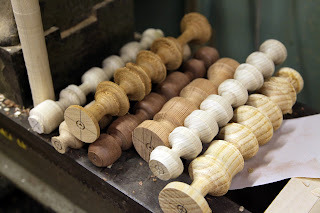 The lathes we were working on were all slightly different but were all in excellent condition and as can be expected from these heavy duty machines, they ran smooth as butter which made working on them an even more enjoyable experience. We had some more practice cutting coves and beads and then got some instruction on copying existing pieces. Copying is a great skill to have on the lathe, whether it's for a repair, some imitation, or just for fun. Once we learned to make master forgeries, everyone then got to pick an end of class project to create. There were several options including honey dippers, a darning egg (does anyone darn socks anymore? 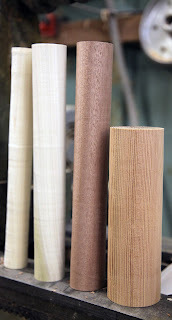 ), some textile tools, a crab mallet (which I will be making at home! ), but I chose the one I actually needed. I have been testing the waters recently at yet another woodworking skill, carving (more to come from this debacle later). I have been in need of a proper mallet and just couldn't bring myself to spend thirty bucks on what is basically a log with a handle. This was a perfect opportunity to make my own...even better! 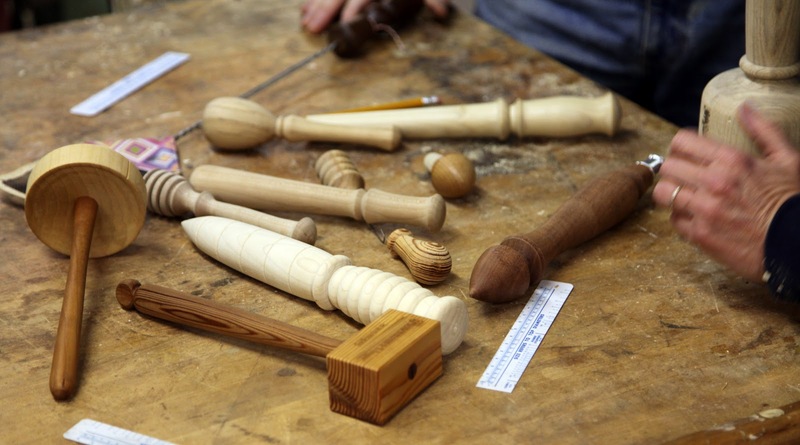 I also learned what a niddy noddy is, as one gentleman was going to make one for his final project...plus it's fun to say...niddy noddy. We quickly covered green turning at the very end of the day with some mushrooms! 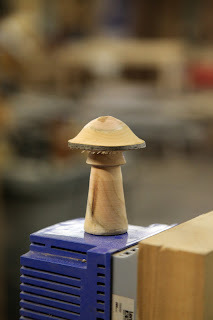 We turned mushrooms from some freshly cut cherry. A mushroom can take as little or as long as you like but it seems like a quick way to make something neat while keeping basic skills sharp. I can not say how happy I am that I was given the opportunity to take this class (plus there was a free Tee Shirt!). I plan on eventually taking the advanced spindle class and bowl turning class they offer as well. Mr. Supik is an excellent teacher, he takes his time, his instructions are clear, he is patient and there was never any hint of ego in his instruction. 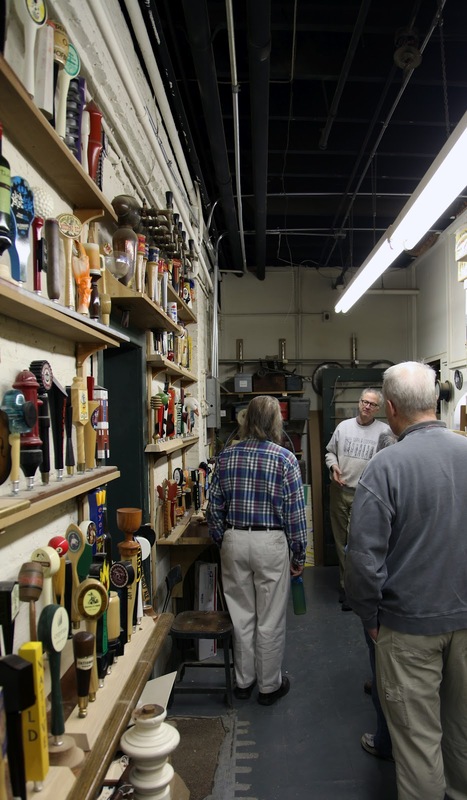 His interests lie purely in sharing his love for an art in a manner consistent with the professional, family owned atmosphere he has developed for his business. If you have an opportunity to come to Baltimore for a day and take a class, you won't be disappointed. 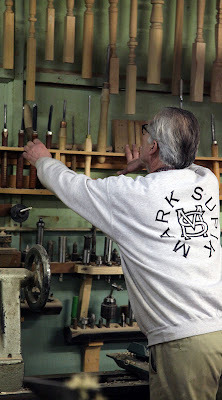 If you'd like to see some more photos from the class I have posted a Flikr album HERE and I'll post a short video I shot as a separate blog entry before the end of the week. Thanks for reading!